Welcome to another month of the Virtual Book Club for kids. In January, we are featuring the author Laura Numeroff. Numeroff has written some of my favorite books for preschoolers. She is widely known for her "If you give a..." series (If you Give a Mouse a Cookie, If you Give a pig a Pancake, etc.) She has also written a series of "What do... do best? ", flip books that feature mommies and daddies or grandmas and grandpas. This month we are teaming up with a group of bloggers to feature book activities to accompany many of Numeroff's wonderful books. My boys focused on one of Numeroff's best known books, "If you Give a Mouse a Cookie". You can check out the book activities we did for that book, link up your own ideas for Laura Numeroff books, or find tons of activities for an author study here! 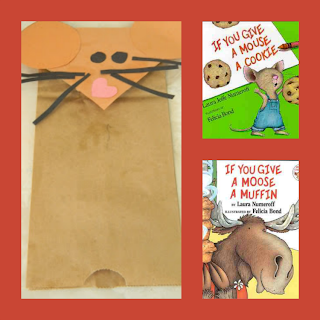 If you Give a Mouse a Cookie is a circular story that tells about a boy who regrettably shares a cookie with a pesky mouse. The mouse begins to ask for milk, a straw, a mirror (to check for a milk mustache), scissors for a whisker trim... and on, and on, and on. The "If you Give a" series of books provide an opportunity to introduce children to the structure of circular stories. Circular stories begin and end in the same way. Children may be able to make a connection to a plant cycle, seasons, or other cyclical event when they read circular stories. When children are able to read a lot of these types of stories, it helps them make predictions and comprehend the meaning of the story. Cut out shapes or allow your preschooler to help cut. Glue on to make a mouse face. Allow your child to create their own circular retelling with items from around the house. Begin with a common household item such as a crayon. Ask your child, "If you give a mouse a crayon, what will he want to go with it?" Go around the house collecting items. If you can, help your child make the story cycle back to the starting point. The familiar rhyme, "Who took the cookie from the cookie jar?" is fun to add to this story. Logan stole the cookies from the cookie jar. Have kids stand in a circle while they say the chant. When you ask "Then who?" have the last person toss a ball to the next person and say his/ her name. Provide kids with three different types of cookies. Let the children taste the cookies. Create a graph to show the favorite cookies. Link up only posts inspired by Laura Numeroff that share children's book inspired crafts, activities, recipes, etc. Any other posts will be deleted. What a cute mouse puppet! 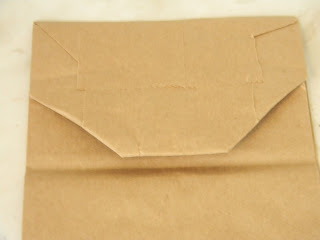 I must get out my stash of paper bags and let the kids make puppets when the weather gets colder here. Love the puppet! Pinned it! Thanks for sharing at Mom's Library! Thanks Debbie! 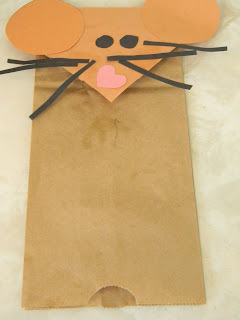 I appreciate you sharing my mouse puppet on Pinterest. I just popped over to your blog as well. What an awesome topic! I'll be back for ideas for Bible fun for kids. What a sweet little mouse puppet! Thank you so much for sharing and hosting the Virtual Book Club for Kids this month featuring Laura Numeroff. I adore her books!